I started to be interested in the question of inner song while working on my posture with the cello. I had many problems and I noticed, while working with my second professor, that modifying my posture had a huge influence on the quality of my sound. I understand that. And I love the Alexander technique for those exact moments in practice of physical quietness and awareness—it’s a practice of noticing those (exact moments), and then, recognizing the choice. For me, when I was a student, I was so desperate to do well. My shoulders were up around my ears, up like this, I was holding a huge amount of tension –I had pain. It was for that reason that I started taking Alexander technique lessons. But ever since that point—over 20 years ago—suddenly, It was a little bit of an epiphany for me because not only I was free of pain, but it was also… the sound just opened up, and I just wanted more of that. It is true, the sound changes completely when you free something. But it takes time. Years. Pain. You face this difficulty that involves freeing what you have inside of you. And it is a paradox because sometimes you want to give everything, but if that is unskillful, for example, if it is simply putting a lot of effort into it, without the reflection, then it is not so beneficial. So the effort has to be channeled…in the most beneficial, constructive, peaceful way so there is no antagonism. One of the things that blocks the expression is when there is antagonism. …just wanting to give everything. That would be my definition of unskillful. To put too much into the music? Well, just to direct my energy like that. I could be fully present if instead of doing that I think of keeping my body as spacious and as expansive as possible, and my neck really soft, and not rigid, and my breathing also expansive and even though the expression is like this (as she draws her breath in sharply and with tension) my breath can paradoxically be peaceful. Maybe it is stronger with the flute because you have this type of breathing. Cellists can breathe randomly, even if it is not good at all. It is difficult to find this. If I think about myself, my personal victory was when someone told me “you are one with your instrument”. This unity between myself and my cello. It is also like wholeness. That’s what I think it is so beneficial. And that’s I think where the…where that beautiful thing that music can offer… of that experience of wholeness to people… One of the most powerful moments where I have ever felt that was, well, to examples. I played in this mens’ homeless shelter once, it was in Phoenix, Arizona, and I was scared to go in there because these men were really tough, you know, they had scars and tattoos. I thought—it was flute and harp—I thought, ‘they’re gonna hate this!’ We had to go through a metal detector. Anyway, it was so beautiful because those men were so attentive and gentle and kind. And the music somehow opened up a space where it took them out of chronological time and their own personal narrative. It is almost like you lift up the anchor on the boat, and then for an hour it is just a shared experience. And then after the concert, it was beautiful because it kind of opened up this space where then you could have conversations with these men. Everybody was kind of changed, lifted up, the experience had done something, and it opened up the possibility of something. I wouldn’t ordinarily know how to relate to these men, but somehow the music had opened up this space where it was possible to relate because something had been shared. And then I very strongly remember after that music had finished, I remember the wall starting to close in again and go back to clock time. And personal narrative coming into it. I remember asking one man there who was acting like a leader, “how long have you been working here?” And he said “no I don’t work– I live here”. You know, it was that story line of our lives. Do you think that this shared space is connected to your own inner space? Totally! I think that is the discipline, that is the training, and for musicians that is really missing. To rewind back to the Brahms, the way that I would prefer to play it involves physical spaciousness. It starts with the body. If I can offer that in the body… it is also a state of mind as well where you are not grasping, not trying to force, rather you are allowing something, a sort of outcome. That goes in viscerally in a different way for the listener. I don’t know if where it starts, mentally or physically, but the way I just did it (she just played Brahms in a different way) it is there in a totally physical playing, where you choose not to become rigid. That is the choice I was talking about earlier on. Like in your neck, you can choose what to do with it. I am not sure it is a choice; do you think it is a choice? Absolutely. It has to do with the sovereignty. It is a sovereignty over your own body, over yourself. I think it requires mindfulness and also courage. Do you know the film Man on Wire? Philippe Petit? He was a wonderful French performance artist who would walk on a high wire, on a tight rope, and he and some friends …his most famous performance was…he put a wire between the twin towers of the World Trade Center. The buildings were being completed so they got into the building disguised as workmen. It is a beautiful story, because there was this deception, but it was for this beautiful reason. And so, here he is one kilometer up in the sky, and he knows the consequences if he falls, he would be dead. To make that decision to put both feet on the wire, it is such a tremendous, act of courage, and a total mastery, mastery over his own mental equilibrium, physical equilibrium, and so when I am teaching and I talk about this, I say: “it is not about relaxation, it is about total command and finding a way to be at peace physically, with a most terrifying situation”. It is so moving to see him. And you know, he sits down on the wire. Or he lies down on the wire. To see somebody offer that kind of peacefulness is tremendously moving. It is not like a trick. And I think when you see a performer that can offer… that… not just to their colleagues, but to themselves and to the audience, then I think that is really beautiful. And because there is no bracing or holding, or defending. When Philippe Petit is on the wire, he is beautifully attentive but still flowing. But he learned that before. Before being a choice, it had to be a possibility. Do you think it is spontaneous? No, no, no! I think it is entirely conscious. You learn how to manage your instrument and then you can make this choice. It is not so much managing your instrument as managing yourself. Because if it is a choice, why is it so painful to come to the point where you are able to make this choice, to master yourself, you are not afraid to play anymore, to express yourself? Sometimes it is the audience, not only the instrumental technique, but you are afraid of being naked. You feel powerless because you know you are giving something so deep, personal, opening up so much of yourself. In terms of the development of the musician, what I think is, there has to be a certain amount of ego strength to do that. And a certain amount of safety. A sense of safety. Not being afraid of being judged? There has to be a sense of safety. For example, when the library in the mind has enough positive memories, and positive reinforcement from teachers, from past performance that have gone well, then there is enough ego strength to let go a little bit. And I think it is always a process. It is a process. And it is a very interesting one for me, because I was so lucky with my teachers, and I feel sorry that you had a bad experience with a teacher and that you had to change everything later on. You know this failure has been an opportunity for me. It opened up the possibility to learn differently, to change my vision of performing music, and to start interviewing musicians. So non-focused on the music itself, but instead on something else. Your mind and your whole nervous system being jangled by fixating on…more on the result. For example, my teacher in Scotland was very honest. When I wanted to go to music school, he had always been so supportive and so encouragine, but he took me aside and he said: “Lorna, just to be realistic, there are very few jobs”. “There are very few jobs, it may not turn out the way you want, it is really tough. And I would not wish my own children to go into this profession”. He didn’t say : “don’t do it”. He just wanted me to be aware, but it put the fear of God into me. The way I practiced with this kind of desperation: “it has to work out.” I was so attached to that end- gaining. I had to make it work. How that goes into your cells, that attitude, it goes into the cells of your body. That was a very kind thing that he [my teacher in Scotland] did with me, a very loving thing that he did, to say that to me, because..he helped me have my eyes wide open, not to be delusional. My teacher, William Bennett, later in London, he is just the most…he is to me one of the best examples of what it is to be a musician. He’s now 80 years old but he has this child-like quality, he’s always had this child-like relationship to what he does: this curiosity, delight, fascination, beautiful commitment. Actually, I always remember a story he tells, he first started working professionally, and the orchestra was playing, and it was incredibly loud, you couldn’t hear the winds at all, and he said: “the oboist was phrasing so beautifully.” And nobody could hear it! And he never forgot that! You used the word : “unity” before, and the title of this book, all of what we create as musicians comes from motion. And so often we just think of it as a kind of intellectual or abstract or imaginative pursuit and not embodied. And so the relationship with the body…I guess that’s what we were just talking about with the Brahms… is that peacefulness with the body, and not antagonism, where I’m not fighting against myself. The first time I played the Brahms, I was fighting against myself, I was trying to play so loud, was so tight that it was acting like a mute, pressing the sound, and then you push more. It is true that to imagine the sound and to embody the sound are very different. What is the difference between the two? he asked me : “what do you imagine?”and I was so closed off I couldn’t imagine-I was too embarrassed to say anything in front of the whole class-I don’t know why. And he got very frustrated with me, he said, you know, “imagine some beautiful cathedral!’ and somehow my mind was too busy at that stage, my body was too busy. There wasn’t a calm lake, there was too many waves on the lake, you know, to sail smoothly. The mind was divided and so therefore the expression is veiled then. One of my favorite poems in relation to what we do is about the zen archer. When there is nobody around, you can hit the bull’s-eye, but when there is someone around, you start to shake. And then if there’s a prize, like if you hit the bull’s-eye you win a buckle or something, suddenly he [the archer] starts to see double. So it’s this beautiful poem about how the mind can get divided, although the skill is not changed. You know, there’s a wonderful book, Zen and the Art of Archery, but I think this is just called the Zen Archer Poem. It’s a very simple poem. It’s about how nothing could have possibly happened to the man’s skill, that was there already, but the mind being divided made him forget his skills or lose his skills, momentarily. How is the mind is divided? Between different ideas? Between your mind and your body? I don’t know but it is like the mind being too stressed. Or maybe it gets back to that end-gaining, like in the context of that poem. Not wanting to be humiliated in the front of somebody if you miss. Or wanting to press him so much, like, you have to hit the bull’s-eye, and so you are too focused on that instead of just on pulling your arm back smoothly. But then if there is prize: “what if I might lose? Or if I might win?” You know that book : The Inner Game of Tennis or The Inner Game of Music ? Oh, it’s a wonderful book! In The Inner Game of Tennis, it’s even better I think than the Inner Game of Music. They talk about the different games that get played on the court, it’s not simply a matter of hitting the ball. You know, there’s all these other games that can play out in our heads, you know? “If I don’t win this championship, I’m such a loser.” Or, “I really want to get the praise of my coach.” So all of those different games that are being played in people’s heads while they’re on the tennis court. I don’t think of it as a dichotomy, duality. I think often in music, especially when people are younger, we have this idea that this person is technical, this person is musical. And there’s often this problem in competitions. And what I tell my students is that I think there is beautiful artistry in honing one’s technique. To my mind, I don’t see a difference between the two. When I hear a very musical player, for example, who is playing out of tune or playing wrong notes, I think: “Why don’t you care? Don’t you care enough about the music? This is not really about your emotions, or about your expression”. I also don’t really believe in self-expression. And that’s something I’ve come to recently. If you’d have asked me in my twenties, I’d have said, “It’s all about self-expression.” But I absolutely don’t believe that anymore. Of course, you should always be expressive in saying something, but I have come to realize that it is not really about my expression. If I were composing something, then yes, and I do think that you have to be as open and as vulnerable as if you were composing something, but I see it simply as expression rather than self-expression. I think that’s a better way to put it. Because I think there can be quite a lot of egocentricity. And I think it puts too much of a burden on the listener. It is like dumping on the listener. Dumping one’s emotions. The Bach Sarabande is a piece I find extremely tender and melancholic. I think I can align myself with that, the way an actor can align. And I would draw from my own experiences of being melancholic. [plays] To a certain extent, I’m pouring myself into it. And I think the framework of that piece, it is not appropriate. It’s such a gentle…what I would prefer to do, is something like this [plays]. In terms of telling a story…you can tell it in the first person or in the third person. So, I once heard a Master’s Class on YouTube with a piano student, Georgy Seborg, who was playing a Haydn Sonata. He was kind of doing what I did in the first version [I played] of the Sarabande. Kind of pouring everything into it. And he didn’t use these exact words, but this is how I interpreted what he said: “it can’t take that. You can tell a story or a play or a novel in the first person, like this is happening to me, or you can relate the story that has happened to so-and-so. And there is a little bit of distance there.” And I don’t think that one is any less expressive than the other. I think that we can put on different hats. I realized, as I was talking to you about ‘dumping on the audience,’ and that’s something that you’ll find in this book…he talks about…I don’t think, as a musician, it’s any different from the way we relate to each other away from music. So for example, in an orchestra, I think you can have acoustic bullies. They don’t follow, the relationship is too dominating, in terms of the relationship. I think this is where the fears and the blockage come in too. It is also the way we are with our instrument, with people, how much we choose to share or how much we choose to protect, how much we feel we need to put on a certain face to be acceptable. If we feel we can be our authentic self or if we feel we have to be part of the group we have to modify that behavior a little bit. I mean, I think it’s all of these things. The first part of this book, Motion, Emotion, Love, illuminates the task of the performer: “How do motion, emotion, and love, the trio of concepts that provide the title of this book, illuminate the tasks of the performer? We shall see that motion perhaps pertains mainly to the first of the performer’s tasks– the production of an instance and emotion to second the development of an interpretation. The role of love is less immediately clear. And, I shall simply assert without argument that love is a prerequisite for the proper exercise of the other two tasks. It provides a context in which motion and emotion[I guess the expressiveness] can operate effectively.” And performance is a communication, a sharing. And there’s all sorts of things in that, that even the way we communicate, or we choose to share, we can be guarded or blocked. So he said: you can wear a costume and you would play beautifully, but it is a kind of cliché, something you add, not the essence of the role. You are wearing a costume. And when we play, sometimes we also have a costume: it is beautiful, the idea is there, but it is less authentic. You are acting. Not being. I was thinking about that: what is authentic and what is not. Because you know it when you hear it. There is a certain resonance. And it ‘rings true.’ We use that expression. It’s like this sympathetic resonance, vibration. And I was thinking, you know, I love listening to interviews with writers, fiction writers. And I truly believe that often the fiction writers can get at certain truths. More than any biography. I love that paradox. And I think the same can be said for musicians too. I didn’t experience the life that Chostakovitch had. Every emotion has a frequency, and if the body and the nervous system are peaceful enough, then I think those frequencies can show up. For instance, if this whole system is like, jarred, or jangled, or the nervous system is too charged, then it masks those frequencies maybe. And are the frequencies within you? Or are they a resonance that comes from the world you have around you? Both. Probably. I love horses, and for a while I was very interested in natural horsemanship, these non-violent ways of training horses, and there are many applications of that to training musicians. Because horses are flight animals. You know, how I think of our nervous systems, as musicians, in a way, it’s like a flight animal., a nervous animal. So for example, if a horse heard a very loud sound he will run, he will go into flight mode. When we are training musicians, it is like working with horses: they can run away very quickly. It has to do with identity a little bit too. You have to be very delicate because, as a teacher, you can influence the child, you could ruin him. And that is the safety we were talking about earlier. A really great teacher—even just good teachers– should be able to provide that sense of safety for the child to explore without fear. Because the two reasons we get tension in our bodies are because of fear. Or, feeling like we don’t have enough time. Even if we’re not afraid, but like, if you’re running late for an appointment, your breathing gets tighter. Those two things. And it is very interesting with very young, inexperienced performers: often they don’t know how to take time with the music or let it breathe. With the horses, it is important to keep the stress level very low, but the attention very high. And the attentiveness. That’s something that I really am fascinated by. You know that experiment when they put the metronomes on at different times, and after a time they go in sync? In a really great performance, I think that’s what happens. With the performers on stage and with the audience. I literally believe that’s a kind of entrainment. For example, they have done experiments with very experienced meditators. They would find the experienced, practiced meditators going into this slow wave, these brain waves. When you hear a beautiful performance where there is no antagonism, where there’s this collaboration without barriers, without defenses, if the defenses can be dropped, and there is some kind of surrender of the habitual defenses, then some kind of entrainment is possible. You know those magical moments in a performance where you can hear a pin drop? How is it possible that thousands of people could be in the same state and would listen so carefully that you don’t want to break that spell? And that’s why I think, just rewinding a little bit and talking about the practice of technique as also a beautiful form of artistry. The practice of technique can be framed in that way. When you have those moments of entrainment, you know how quickly they can be broken, that spell can be broken by something out of tune, or a wrong note. It is not that there is a kind of black and white judgment, “Oh, you idiot. Why did you make a mistake? You are not a good player!” It is not a question of framing it like that. It’s more like—“I don’t ever want to play out of tune.” I mean, of course I do! But my motivation for not playing out of tune is because I don’t want to break that spell. And that is very different; it has a very different quality in my body. Because it is constructive, it’s not judgment or, like, narrowing. I don’t think about making a mistake as a punishment. Some teacher would punish a student, or humiliate them or belittle them if they did something wrong. That is where the love part comes in. The generosity of spirit. The collective generosity of spirit in offering something, in communicating something. I don’t want to break that by my mistake or by my playing out of tune. Maybe there is a connection between that and the childish quality you were talking about before. You know, actors playing with children say that they have this capacity to keep things intact, they are natural. I think part of that may be because children are still in their bodies. Children are naturally so much more embodied than adults. Perhaps. I’m very curious about the role of teachers and teaching. I had a beautiful experience in India once. We played in Madrass, in the British consulate, and it was like this exchange. There were local musicians, there was a string quartet, a tabla player, they played a movement of Beethoven, I never forgot this performance. I was about 24. I have never forgotten that performance, because these men had very little formal instruction. I guess they more or less taught themselves to play. Maybe the odd lesson here and there. They had learned from listening to recordings. And it was so beautiful, It was so expressive, that I remember at the time thinking, ‘what on earth…maybe we kill something.” I remember thinking, ‘it’s such a responsibility not to kill the quality that these men exemplified.’ That’s a very hard balance. I remember as a child how I was holding my instrument, with so much affection, and how I lost that and had to restore the connection later on. The professor has this power to encourage or to kill the spontaneity of the child playing. I don’t know, because I think that even with kind and good teachers, it is still possible that this might go in waves. There may be times of development where the spontaneity goes a little bit, and then it comes back. I hope so, anyway. So how do you teach small children? I can’t teach them. I don’t have that skill. The only teaching I do at the moment is at the university. I don’t know how to relate with the little ones. With young adults, can you notice the talent in your students? Yes. Definitely. Today, we had an audition, and it was so interesting…just the different personalities that show up: very flashy players, a little bit of a speed demon, another one who was so sensitive. We all have the ones that we gravitate to more than others. I don’t really know how to answer that. I mean, there are qualities that I like in so many of them, It is very difficult to decide sometimes. I would say that when I listen to auditions of students who want to come and study with me, one thing I do value enormously is courage. Courage to play? Courage in what sense? Courage to be willing to try new things, to be willing to take risks, also in performance to take risks, you can sense that when you hear them play, how courageous they are, or how safe. I think that is one of the qualities I value the most. So back to your early training– how did you get close to music? Are you from a musical family? My parents enjoyed listening to music. My mom used to sing in choirs, my dad was a very cultured man. He was a schoolteacher but he loved poetry, he loved novels, he loved nature, he had a sensitivity for music, he genuinely loved music. He would take my mom to concerts in Glasgow. That’s when I heard my professor in Glasgow, David Nicholson. As a kid, I was a little bored, but I was so attracted to the sound of flute, this sovereign sound. I am sure we are attracted by a particular sound, just like we are attracted to a person: for its original shape. Yes. And the way he played was so animated and alive. I would say that is another quality I look for in the students who are auditioning: do they have a sense of their role in the world. Your role is to bring the music to life, it is not to impress people, or for your own praise. You can also gage their motivation. Nothing authentic will come out when the motivation is from praise. It has to be a selflessness. Or some surrender. It is not self-conscious anymore. Music is not about ego. The Scottish countries are probably also very musical, right? I mean, the traditional music is very alive. Yes. And it’s very egalitarian too. You know, going to the symphony is generally not associated to status or anything like that. Sometimes here, I think it’s more associated with status. With being in a certain social class. In Britain it’s less so. Another important word for me: empathy. I think it is what makes a great musician, actually. And probably a great actor. Empathy like an interest, an ability to step into somebody. So empathy with the music? Or with the people around you? Both. So, for example, earlier, when I said…of course my life has been nothing like Chostakovitch‘s life, but you can imagine and you can empathize. So even if you don’t live it in the first person, you are able to share the emotion. Yes. And I think that is also…it’s not the business of self-expression but just expression. The empathy ties into that. It’s not really empathy where it is just self-expression. Because there is too much of yourself! But at the same time, we have to express ourselves. It is a balance between not expressing ourselves and being fully present as what we are, our personality, what makes us… us! It is like the actor’s costume: the costume can’t fit everyone; it fits just one person, his personality, his stature etc. Yes. 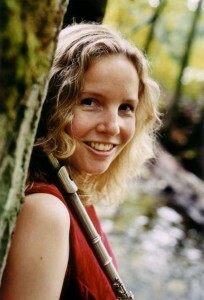 What I notice with the flute is when you get people to sing in lessons: everyone has a particular natural voice. It was quite interesting, I remember once a girl having this beautiful singing voice, a light, soprano voice, and her voice on the flute was also like a sparkling light. For example, my teacher William Bennett, he’s a big guy, he’s got this wonderful baritone voice. I think I am a kind of alto. Everybody’s physiology is different. Sure, when I play, there is a relationship between how I play the instrument and my voice. And maybe more so with singers. What is this innervoice we use to sing inside of our head? Is it the same voice? This is just an idea, I think it might be because it brings into play the linguistic part of the brain. For example, when you are playing the cello, the sound production is so far away from your speaking voice. And then when you sing it, maybe it activates the linguistic part of the brain. Maybe it becomes more integrated. I was at a lesson with a alexander technique teacher. He said to me: “you can take a breath on the flute to get from A to B, like putting fuel in the car, functional, so this would be the functional one. [She plays]. “Or, you can take a linguistic breath, where it is not just for getting from A to B,” but when you totally identify with what you are going to say. [She plays her flute]. Something I find really interesting is when you start really existing internally. This is something I’m really interested in in lessons. Being inside our playing… Not outside. You know, the way I describe this internal hearing to my students is not just generating the sound, but receiving it. This hearing in your head is like inviting the sound. You generate the sound, but you also receive the sound. There is a receptive state and not only an active state. I am sure it is mostly receptive. For me, this is the difference between imagination and hearing inner song. For me, it is receptive. Yes. If it is something you receive, that means that we have an inner space where we receive the world, the sound. And when we express it, we make that sound come out. If we receive the sound, the problem of self-expression, ego and so on, is gone! It is! You used the word “unity” before. Like when you receive the sound at the same time you generate, there’s some kind of unity that happens. That wholeness. And if I sing what I am going to play, it is the same! I receive the sound from my ear. It comes out and back to me. The receptive part is obvious at this point. If someone ask me “what do you imagine?” I don’t know, but if he asks, “what do your hear”, then I know. I have something already. I have to try to grasp it. If I just generate the sound, [plays] I press it. If I receive it, it is different. [plays] There is something so beneficial about the receptive process. It is not self-consciousness. It is not the same as reacting to the sound. Because then, that can also be a block, fussing, where you play a note and immediately react or adjust. [plays] Like a flat. That is reacting. That is different from receiving. [plays] It is so illusive; It has more to do with inviting, and allowing, and receiving. There is a sort of passivity. A welcoming attitude. I receive something. It changed me when I started to think: “I can play what I heard,” and not “I have to imagine something” with the stress of not having anything to say. If it doesn’t work, the problem is not anymore that I am not creative; it is more that I am not attentive. I am sure that the very good musicians are able to grasp that. To be attentive. I remember my teacher telling me: “close your eyes and listen.” It changed me. It opened my own inner world. It is like an invitation to go internally. It is like this porous membrane between the internal and the external. What do you mean? I agree with you, but I want you to be more precise! For example, in these auditions this morning, listening to the oboe players, it is entirely possible for them to be externally-oriented. Especially when you’re just doing excerpts and they’re maybe 12 bars long or 24 bars long. It’s not like an entire…Thank you! You’re whole question has helped me to define something that I’ve struggled with for years and years and years. Because…there’s something that can really kill the auditions, thinking about the Indian quartet, and institutions, or ways of teaching or performing that can really kill things. And, part of the problem with auditions is almost entirely outward focused. For example, you come on stage, and there is this screen between you and the committee in the first round, so it blocks this exchange of energy. Already, there is this external object and you are not with a human being. And it is taking away the humanity of the people behind it. I mean, this is how I perceive it. Of course, I understand it’s there to encourage fairness and no favoritism, no sexism, I understand. And it’s something that I’ve always struggled with. Because in Britain, when we did auditions, we didn’t have that. And so if you’re whole relationship with music, if your whole philosophy is about…Ok, my philosophy is it comes from a generous… it has to do with love, generosity of spirit, it’s eros. You hone your gift and then you give your gift. And there has to be a receptivity also on the part of the audience. So it is not only the performer that also has to be in a receptive state, it is also the audience that needs to be in a receptive state. He talks about it [the relationship] beautifully in this book—in this book I told you about early on, Love, Motion, Emotion: “Audiences respond to performances that include them, even though they may not be able to explain what the performer is doing differently.” So that is when, I think, there’s a generosity of spirit. Performing is a sharing or communicating a kind of living. I see it as this chain reaction. There has to be a relationship with one’s self, which is in a way what you are describing about receiving the sound, and so there is that relationship, and if that is not there, there can’t really be this secondary one with the listener. They won’t receive very much if that relationship is not there in the performer. The most the audience can do is admire or criticize, those are the only options really, or to appreciate the piece that you are playing, but not necessarily receive that instance of its entirety. They won’t get the unity thing. They would be denied that. I think that is the problem these days with classical audiences diminishing: I think they don’t receive enough. Because, there is so much self-consciousness, so much guarding or defending on the stage, so much lack of safety, I think at this level, it is quite hard for the performers to sink into that kind of unity, and it takes a lot of courage to do that. And that’s why I think the audience… why most of the performances I go to, I don’t feel anything. I am so grateful when I feel something. When somebody is offering. For example, Emmanuel Ax, he is so generous! He is just so open-hearted and generous! He plays with the heart. And that what it is! Being open and not concerned with our security and our safety. It is just the same as in relationships with people. If you’re in a group where you don’t feel safe, or you feel like you might be criticized for what you say, you are concerned. There is something in common between music and being in love. When someone is in love, he has no concern about how he will be judged by the other person, if he is safe or not, it is just giving and receiving. Opening. And if you are whole inside, your gift is fuller. If you have so much inside of you, in your inner space, you can give so much. If you are able to be open to the other person, attentive to him, you can receive even more. It is a loop, a constant exchange between myself and the other person. And there has to be some trust that they won’t take. Or that they won’t disregard or disrespect the gift that’s being given. And I think with musicians one has to make one’s peace with the idea that there will be people who do that. We need to be trustful enough to realize that the other person will not destroy what I am giving, my innerspace, my gift. Of course there is a risk to take. And also precautions. In order to open yourself, you have to make sure that the other person will regard it as precious as it is. Take care of it. Keep it preciously. But once you trust, you have to let your fear completely go: you can fully trust. So just open yourself. Play. Of course. Let’s talk about other directed action. I want to think that a loving relationship is more like a collaborative performance. Performers must accept one another, just as the lover sees flaws and shortcomings and virtues in the beloved, accepts the entire individual. Warts and all. That is the one. Performers see the strengths and weaknesses of their colleagues. But they must accept and work with them. Performers are in it together and will make it work. Exposure. This is what you talked about before, the nakedness. We spoke earlier about how a performer must reveal and expose himself to his audience. And we saw this requires courage and a sort of self-love. Absolutely. Self-love is so important! If you don’t have it, you don’t trust in yourself, so you can’t express and give anything. And also, how can you trust other people? From my experience, I can say that playing reinforces the relationship with myself, and therefore with others. A performer also exposes himself to his colleagues and also his uncertainty, the apprehensions that this involves can be just as great as it is when exposing oneself to an audience. I have to say that I feel that in every rehearsal. Every single rehearsal, I feel just as exposed as in concerts. What will they think when they hear me play or watch me dance or hear me speak my lines? Will they think that I am good enough? Do they want to work with me? No performer is entirely immune to such worries. Nevertheless, it is essential to overcome them and to stand naked before one’s colleagues. And then, reciprocity. Performers reveal themselves to one another, they accept one another. So it obviously goes both ways. And then, right at the end of this book, something really beautiful: “And I think that an artistic performance is a bringing together.” See, that’s what I think is often lost. I think often, it’s beautifully executed, even beautifully crafted, but not necessarily a bringing together somehow. Yes! That is something beautiful in the English language. We don’t have such a strong connection between emotion and motion in French, “émotion” et “mouvement” are two different things. Something moves, there is some transition, you know? That is so important! I think Barenboïm talks about that! I know. I got so interested by Parallel and Paradox when I read it last year. Oh my God– I loved it too! This is lovely. “Music is so important and so interesting to me because it is, at the same time, everything and nothing. If we wish to learn how to live in a democratic society, then you would do well to play in an orchestra: for when you do so, you know when to lead and when to follow, you leave space for others, and at the same time, you have no inhibitions about claiming a space for yourself. And despite this, or perhaps precisely because of it, music is the best means of escaping from the problems of human existence.” I love this: “music is sonorous air”. Me too! I am sure that we have a sonorous interiority. I am sure we are musical. We are sonorous human beings. Without defining the border between out and in, just as with the ear, which is not a frontier, but something that allows a passage between two spaces. There is permanent communication. A loop between the two spaces communicating with each other. Apparently, it is also the first of the senses within the womb. And also, the last to go also, they say. There is this uninterrupted connection. Yes. It is what Barenboïm says in this book when he says that identity is a set of flowing currents. I think that ties in with the idea of empathy. So as a musician, you can step into the shoes of Chostakovitch and his life for one of the Symphonies. Or then you can step in with Debussy. I love this idea of the flowing currents. An interpreter of literature and literary criticism has to accept that idea that one is putting one’s own identity to the side in order to explore the other. So I think that’s what I mean by not self-expression too, but just expression. Barenboïm talks about how each of us has the capacity to be many things. “…sense of identity as a set of flowing currents, rather than a fixed place or stable set of objects.” I like that-it’s really lovely. You know someone else I think might be interesting—you know Celibidache? He also speaks about unity and resonance. Exactly. I did a Master’s Class with one of his disciples in France. He talks about, even…I remember, there’s something on youtube of him talking about his experience with music, and some of it goes right over my head, but some of it I understand instinctively. I can see why you feel so close to him. For example, he didn’t like doing recordings, and for me, it has to do with his inner song! Because, how can you possibly capture that? And maybe for him, he felt that that destroyed it, to a certain extent.. I think of moments of entrainments, in a concert, he talks about how it’s like you can almost hear four octaves above what’s been played. It’s like something comes right down through the middle of it. It is a movement of embodiment. The way he described it was very esoteric, but you know, I can think of a few examples. I remember, for example, doing ___’s [1:34:02] 2nd Symphony with Gergeiev conducting. I will never forget that concert, because there was such a total moment of entrainment where there were like 90 people on the stage, and the conductor looked around the whole orchestra: “are you with me? Are you with me?”in that split second, and then it was so amazing, the rubato and the sweep of it. Everybody got swept along. How is that possible unless 90 people are willing to surrender? Not to him. To the music. To forget themselves. To bring the anchor up. Just go with the wind. Not over-control. It was beautiful. Tremendous. Things like that stay with me for a long time. And that’s the interesting thing. It’s a fleeting moment in time. But those moments, they can stay with you. The great conductors have this ability to extract your innersong from yourself. There is a magnetic attraction. Some of them are magnetic. Imposing. But not overbearing. Huge presence. I think of conductors like lightening rods, you know. Of course, they need to have good technique, but I think their role is primarily to hold the frequency. To hold the energy of the group. And all the great musicians have this presence. Having a presence. Being present. And being in their bodies too. There is that physical unity. I read something on meditating the other, and it made me wonder…they talked about the electromagnetic frequency of the brain and the heart. In meditation, they can be kind of unified. It was kind of a scientific way of thinking of it that made a lot of sense to me. And you talk about this kind of magnetic quality that has to be present with conductors, it’s similar, I think. I think I will end with those marvelous words. Thank you Lorna, and see you in ten minutes on stage ! After the interview, I decided to go to the concert and had the wonderful experience of listening to Emmanuel Ax and the PSO.